21 records – page 1 of 1. 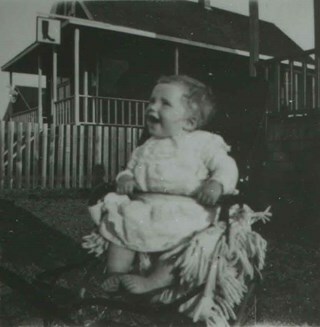 Photograph Le Grove family home at 3250 Neville Street (later renumbered 5422 Neville Street), Alta Vista. Frederick Le Grove and his friend, Ernie Carpenter, built the home prior to 1913. 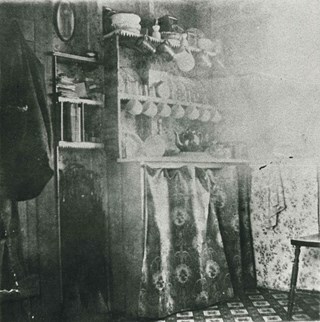 Annotation under photograph reads, "3250 Neville St Alta Vista, [Burnaby] / Royal Oak 1913"
Photograph of the Le Grove family home kitchen at 3250 Neville Street (later renumbered 5422 Neville Street). This was the home of Ida Le Grove (nee Burlton), her husband, Frederick Le Grove, and their family. The house was built by Frederick Le Grove. 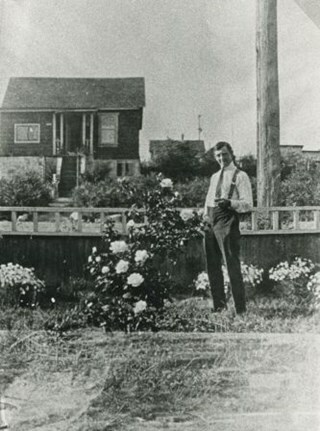 Photograph of Frederick Le Grove in the front yard of his home at 3250 Neville Street (later renumbered 5422 Neville Street). In the background is the Boscott family home. Fredrick Le Grove was married to Ida Le Grove (nee Burlton) and lived here with his family. 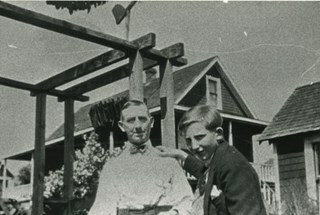 Photograph of (left) Frederick Le Grove and his son (right) Lyle Le Grove (Carlyle) in front of their family home at 3250 Neville Street (later renumbered 5422 Neville Street). To the right, is the home of neighbour, Sam Bickerton; to the left is a shoe repair business run by Mr. Bickerton. 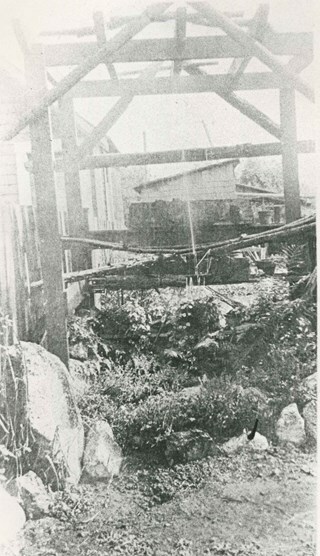 Photograph of Mr. Frederick Le Grove's pride and joy, an arbour and fountain he'd made himself. Water was piped from the basement. Mr. 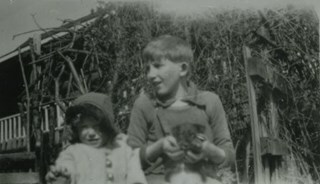 Le Grove was married to Ida Le Grove (nee Burlton) and lived at 3250 Neville Street (later renumbered 5422 Neville Street). Photograph of Lyle Le Grove at 3250 Neville Street (later renumbered 5422 Neville Street). The Sam Bickerton boot repair business is in the background. 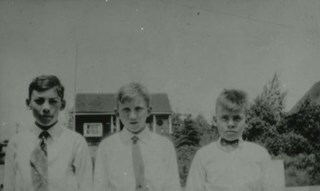 Photograph of (left to right) Rich Pattinson, Lyle Le Grove and Bill Fraser at 3250 Neville Street (later renumbered 5422 Neville Street). 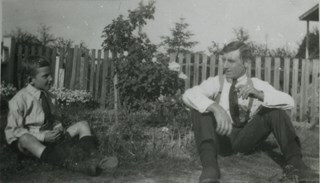 Photograph of Lyle Le Grove (left) and his father, Fred Le Grove, seated in the garden of 3250 Neville Street (later renumbered 5422 Neville Street). 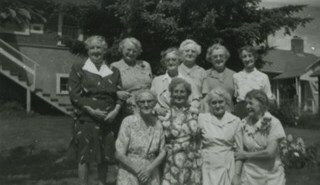 Photograph of a group of women gathered for the last meeting of the Daughters of England, which took place at Gilley Avenue and Neville Street. 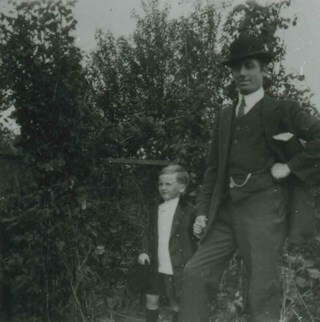 Photograph of son and father, Lyle Le Grove and Fred Le Grove, standing at the back of 3250 Neville Street (later renumbered 5422 Neville Street). Photograph of Dorothy [last name unknown] and Lyle Le Grove outside 3250 Neville Street (later renumbered 5422 Neville Street). Lyle is holding a puppy. 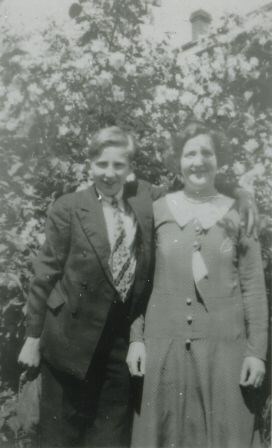 Photograph of son and mother, Lyle Le Grove and Ida Le Grove, at 3250 Neville Street (later renumbered 5422 Neville Street). 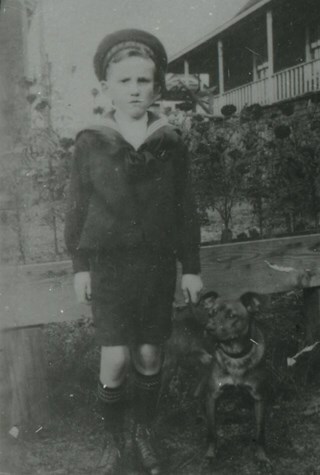 Photograph of Lyle Le Grove standing with a dog outside of 3250 Neville Street (later renumbered 5422 Neville Street). Photograph of husband and wife, Ida and Fred Le Grove standing outside of 3250 Neville Street (later renumbered 5422 Neville Street). 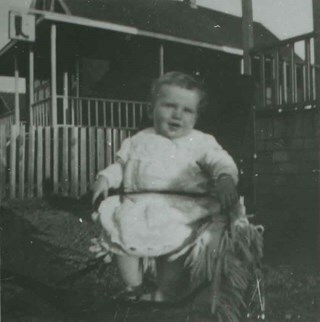 Photograph of Jimmy Stott standing at the back of his home at 3213 Neville Street (later renumbered 5561 Neville Street). A Rumble Street house can be seen in the background. 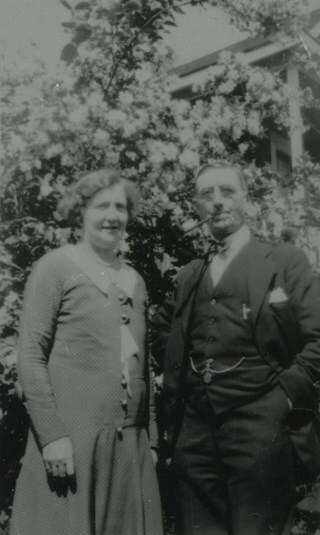 Photographic postcard of Fred Holdsworth and his wife standing outside their Neville Street Home. The house is two storeys with an attic with windows. The porch is elevated with steep stairs leading to the front door, which is on the second floor. They are both standing with their hands on their hips. There are variant spellings of "Holdsworth" used in the notes in the accession file. They are "Houldsworth" and "Hallsworth." The 1937 British Columbia directory lists a Fred Houldsworth at 3345 Neville Street, Burnaby. The address was later renumbered 5249 Neville Street. Photographic postcard of the Holdsworth house on Neville Street. The house is two storeys with an attic with windows. The porch is elevated with steep stairs leading to the front door, which is on the second floor. There is a woman standing in the porch, looking towards the photographer. Another house is visible right beside the Holdsworth house. There are variant spellings of "Holdsworth" used in the notes in the accession file. They are "Houldsworth" and "Hallsworth." The 1937 British Columbia directory lists a Fred Houldsworth at 3345 Neville Street, Burnaby. The address was later renumbered 5249 Neville Street. Photographic postcard of Neville Street just off Royal Oak Avenue. The street is a dirt road lined with residential buildings on one side and eletric power poles on the other side. 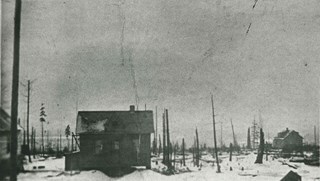 The Holdsworth house is seen being constructed on the left. There is scaffolding on the side of the building and a cleared lot beside the house. here are variant spellings of "Holdsworth" used in the notes in the accession file. They are "Houldsworth" and "Hallsworth." The 1937 British Columbia directory lists a Fred Houldsworth at 3345 Neville Street, Burnaby. The address was later renumbered 5249 Neville Street. An annotation on the back of the postcard reads: "Nevil [sic] Street - 1912 - Just off Royal Oak." 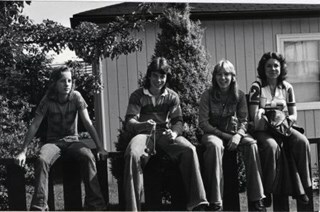 Photograph shows teenagers from McPherson Park Junior Secondary School sitting on a fence outside a home at Roslyn Avenue and Neville Street during their lunch break.